This, when a quantity of football gear was presented to the affiliate groups, during the presentation ceremony of the 2014 national Inter-community League and the 2013-2014 National Club Championships. 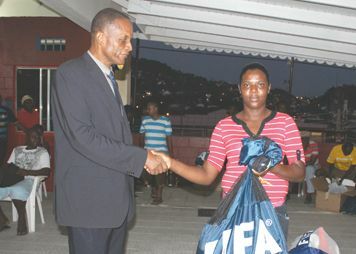 Among the items received were footballs, bibs, cones, socks, shinguards and jerseys. Coombs disclosed that his organisation had sourced the equipment from the world governing body â FIFA, but used the regional confederation CONCACAF as the conduit. âYou have to praise president (Jeffrey) Webb in his effort to develop the Caribbean, because we need the help and through his initiative we got them through FIFA,â Coombs said, as he echoed gratitude to Webb, who is CONCACAFâs president and a FIFA vice-president. At the closing of the 2013 Arnos Vale Football League last December, chairman of that league Michael John called on the SVGFF to assist the leagues more.